The 125cc Ducati Desmo proved to be a race-worthy competitor to the MV Agusta which was dominating the 125cc class. Interest in Ducati from across the Atlantic had prompted two brothers, Joseph and Michael Berliner to open the Ducati franchise in the United States. The Berliner corporation had a great deal of influence in design direction meant for the American consumer. 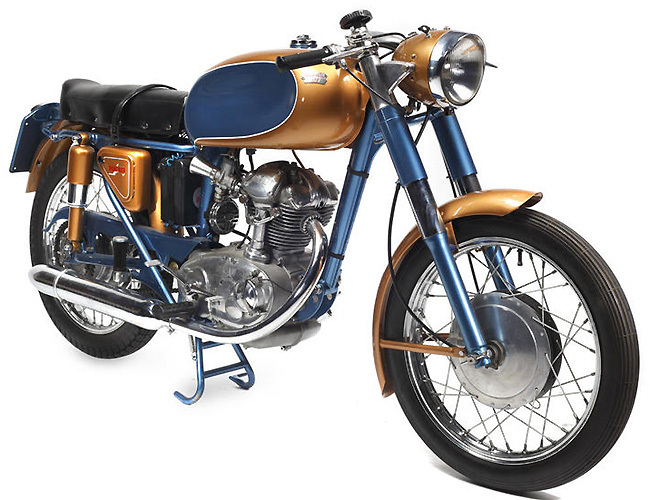 In the late 1950s, Ducati introduced the 125 Monza and Monza 'Super,' and Ducati was now trying to squeeze as much horsepower as possible out of their 125cc engine, with their retail competitors moving to higher displacement engines. The Ducati 125 Sport is never going to set records in terms of value. With just 125cc, it doesn't have the big V-twin bang that Ducati's later products did, and even among Ducati singles, it's not the most valuable, with 175 and 200cc machines, and the near-race-ready Mach 1 bringing the biggest bids. Nevertheless, it's like having an Australopithecus in a natural history collection: the missing link in a long chain that begins with a powered bicycle, and ends with Grand Prix champions. These are simply beautiful classic bikes worthy of any collector. They are reasonably priced and make a great classic riding bike requiring little maintenance.